Fixed 8 mm cockring for chastity belts type "Cage"
This surgical steel cockring is made for the chastity belt type cage. The lid is made to the ring a little off-centre to use it in two ways. 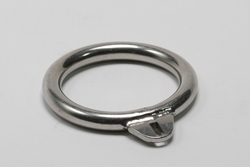 By turning the ring the gap between the chastity cage and the ring can be different. This comes on top of the adjustments that can be made by the different settings of the pin and lock. We advise to take the cockring for a chastity belt one size bigger than a normal cockring, as its function is different.